If you didn&apos;t catch the trend in our April/May issue, then you&apos;ve surely been noticing it on the streets—the spread of hard bottoms (a.k.a. 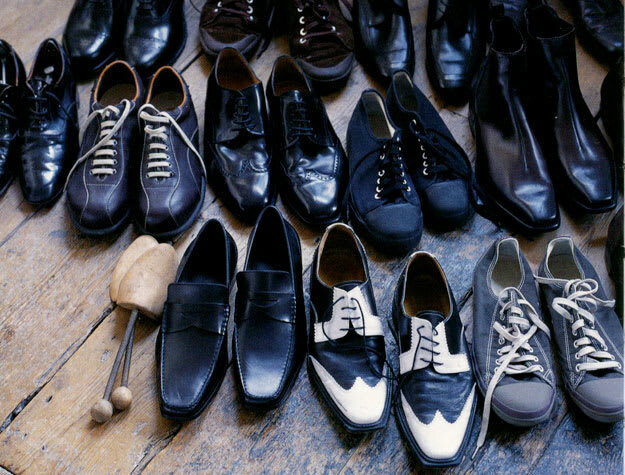 dress shoes) among the Complex generation. Yup, hard-bottom shoes are no longer just for corporate jobs and weddings (and court dates, you miscreants): If you&apos;re still wearing sneakers 24/7/365 and you&apos;re not in high school, it&apos;s time to start incorporating some grown-up shoes into your repertoire. Look, we're not suggesting you go Gordon Gekko overnight. One solid pair of proper footwear may cost the price of an Air Jordan Pack, but it'll last you many, many (many) years longer. So what follows is an easy introduction to the different types of dress shoes, how to buy a pair, and when (and with what) to wear them. We're gonna ease you into some hard bottoms, my dudes. Pause infinity! Click HERE to buy the Graham Dress Oxford at calvinklein.com, $148. WHY: If you&apos;re buying your first dress shoe and have a limited budget, this is a must-have. It can be worn either casual or dressy. For your first pair, we suggest going black first. DO: Wear this dressy with a proper suit or casual with straight-leg, dark/indigo denim. The cuffed look works great. DON&apos;T: Avoid shorts (obviously). Beginners should also stay away from the "khaki pants x oxford" look that Blockbuster employees made famous. Click HERE to buy the Classic Leather Penny Loafer at jcrew.com, $150. WHY: It&apos;s less heavy and slightly less informal than the others. Plus, a little WASP style never hurt anybody. DO: Wear with slim-fit denim or narrow pants. Daring types can try it with khaki shorts, but only if you&apos;re vacationing in Cape Cod or Monaco. DON&apos;T: Instead of your usual shoe size, go down a half because the cut is lower and the leather will expand and stretch out over time. Click HERE to buy the Kenmoor at florsheim.com, $225. WHY: Also known as Brogues, this traditional country-club classic has a wing-tip pattern that always lends an air of sophistication. DO: Think dark colors paired with similar tones, like black with gray wool pants. Brown/burgundy wingtips go perfectly with khakis or white denim. DON&apos;T: Make sure they are supportive, and not squeezing your foot. Click HERE to buy the John Varvatos Murray Chelsea Boot at bergdorfgoodman.com, $498. WHY: The Chelsea is a leather boot with a slight heel which can look sleek dressed up or down. Also from the same family, the Chukka has the same silhouette but is made from suede and calfskin. DO: From traditional to casual, these boots go well with narrow suit pants. For a more relaxed look, try the Chukka with boot-cut denim or cotton pants. DON&apos;T: Never rock the elongated tip (ayo!) or them Purple-Rain pointy stiletto boots. 1. KNOW YOUR SIZE. If it&apos;s you&apos;re a rookie, don&apos;t shop online; your safest bet would be to go to a retail department store or an independent boutique. If you have a large instep, they can conduct proper fittings to determine your exact width size. 2. INVEST IN A SHOE KIT. Wax polish, a horsehair brush and a dust cloth will preserve the life of your hard bottoms. 3. USE TREES. Shoe trees are necessary to retain shape and remove odor. If necessary, you can also stuff your shoes with newspaper. 4. DON&apos;T SLIP. Scuff new leather bottom soles with a wire brush to improve grip. 5. GET YOUR SOCKS UP. White athletic socks with dress shoes is definitely not the move. Stock up on silk solid-color socks for formal wear, wool or cotton solid-color socks for business attire, and all kinds of funky styles for casual wear. 6. GIVE IT A REST. These ain&apos;t Vans, sucka! Rest a pair of dress shoes for a day after all-day wear.